What a good conference weekend! I really enjoyed the talks and because I don't take notes ( I know I should, but it is hard with kids) I can't remember who said what. But I do remember certain themes that stuck in my mind. I liked the reaction President Monson got when he announced the temples and also all his talks. I also liked Elder Wirthlin's talk about simplifying your life ( I think it was him). Someone mentioned laughing at things that happen instead of having other reactions (might also have been Wirthlin) which was cute, but John says I shouldn't laugh at the kids when we are playing games. We played a game of Mario Party 8 during the break and it was funny. I really loved when the choir sang Faith in Every Footstep; I love that song. There are too many talks to remember, which is why they print it later, but it was all good. Our family has a tradition of making cinnamon rolls every conference and the kids really look forward to it. John and I started this tradition when we were dating. On Sunday, Valerie even told her Primary teachers about it, who then teased us and asked when they would get theirs. I told them you have to watch conference with us if you want the cinnamon rolls. Which is true for everybody. If you come watch conference with us, I'll make cinnamon rolls for you. But you have to sit with four kids not paying attention very well. 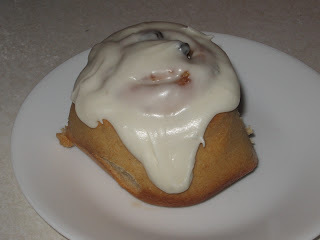 It is quite a struggle, but the cinnamon rolls are really good! We have had pretty constant rain for the last 2 days, except for this afternoon when the sun came out for a little while. 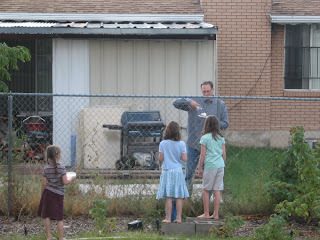 This week our bishopric came over for a family visit and we gave them some raspberry jam I made that day. Today during the break one of the counsellors called me and asked if he could bring the kids over some scones filled with our jam and topped with whipped cream. He lives behind us to the left so he said he would hand them over the fence. He is putting the whipped cream on a scone in the pic. I thought it was cute. I can testify to the goodness of the cinnamon rolls! Wish we could have been there to watch with you guys. We had a hard time hearing over just two kids, but I still thought it was an awesome conference too! We love you guys and miss you. Every Conference i vow that I am going to adopt that tradition! I loved Elder Nelson's talk on the boy who crossed the river to herd the cows. Becky was being diplomatic when she said that the kids weren't paying attention. Half of them were either demanding our attention or demanding use of the TV to play Wii. Once upon a time 5 years ago Harley, Danika, and I watched the October conference with yous guys. It was just 2 months after Danika was born. Uhh, just thought I would tell you that. I think Harley's cousin dave came over too and I think I remember a game of Master Piece-the art auction game. Good times.